The Reagan Show is both a valiant exposé and a victim of the president’s publicity machine. Thirty-two centuries ago, when Ramses II wanted to project an image of himself, he assigned swarms of artisans to carve his likeness out of the rock at Abu Simbel, not once but four times, decreeing that his quadruple gaze should scan the desert from a height of 66 feet or more while mere humans milled below the level of his soles. Today, to make us look on his works and despair, our pharaoh simply types 140 characters. It’s a familiar story, this evolution of the tools of persuasion. Lincoln grasped the new opportunities presented by photography; FDR, radio; Kennedy, television. And when you consider that the means of communication have changed far more in the blip between Lincoln and Trump than they did in all the time from the New Kingdom to the American Civil War, it’s understandable that we often speak as if what’s novel in our situation is the technology, rather than how we use it. Pancho Velez and Sierra Pettengill don’t make that mistake in their documentary The Reagan Show. 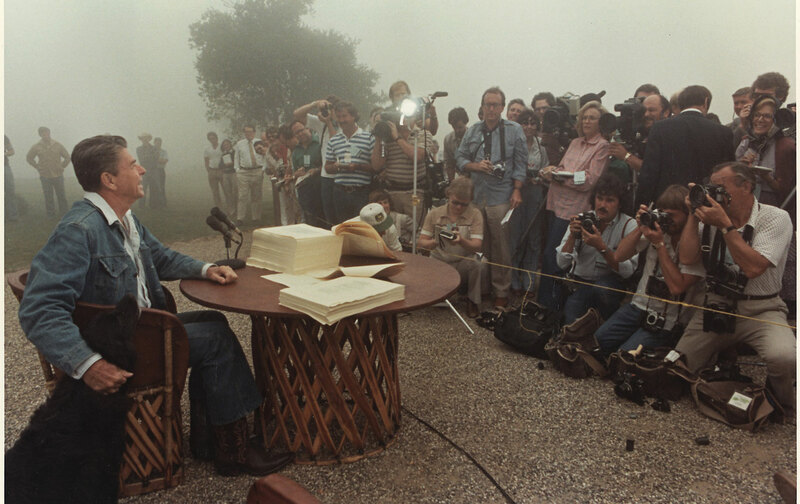 Using only archival materials—principally news broadcasts from the years of the Reagan presidency, and selections from the miles and miles of videotape that the administration recorded and distributed through its White House Television Office—The Reagan Show pieces together a narrative about a historic shift that happened some 30 years ago, when images devised for mass distribution became more than instruments for winning political power and enacting policy. For the first time, it seemed as if manufactured images were the policy. That, at least, was what many people thought, to their dismay. In The Reagan Show, you can see Chris Wallace grouse to the audience of NBC News about Reagan’s spending two-thirds of his time on ceremonial occasions and PR opportunities. In Wallace’s account, this disproportion made Washington question whether Reagan was in charge of his own administration. But in other contemporaneous clips, White House insiders argue that Reagan’s continual selling of himself was an act of governance. Michael K. Deaver, the deputy chief of staff, told Barbara Walters that policy-making is all a matter of “how you stage the message.” David Gergen, Reagan’s director of communications, claimed that the White House has always been a stage. The only question is whether you allow the TV networks to manage that stage or step up and do it yourself. I suppose Ike managed. So did LBJ. But it doesn’t matter that other presidents found it possible just to do the job. For Reagan, it was possible to do the job just by seeming to be president. He took that for granted; and today, Trump takes it for granted, too. In some of their film’s most entertaining moments, Velez and Pettengill puncture that magic by exposing the behind-the-scenes work that went into it. When Reagan, as president, filmed a commercial for John Sununu’s campaign for governor of New Hampshire, he earnestly told the camera that he was making the endorsement on the basis of personal knowledge, then botched take after take because he couldn’t pronounce “Sununu.” Nancy, too, got caught in the outtakes when playing her role as the delighted and ever-devoted wife. At the Reagans’ ranch in California, Ron climbed onto a horse before the cameras of the White House Television Office and cheerfully rode off on cue, while his co-star perched in brittle misery on her saddle. Pettengill, an expert on researching and using archival material, has masterfully plucked such scenes out of the 66-foot colossus of videotape that Reagan’s staff piled up. (In one of its rare title cards, The Reagan Show asserts that his White House recorded as much footage as the previous five administrations combined.) Velez, meanwhile, brings to The Reagan Show the combination of curiosity and formal rigor that he exercised in his previous documentary feature, the 2013 Manakamana: a travelogue, thrill ride, human-interest story, and structuralist experiment all in one, made with Stephanie Spray through Harvard’s Sensory Ethnography Lab. The Reagan Show is neither as multifarious as Manakamana nor as strict in construction, but it does involve a similar project of working within limits—in this case, the visual evidence left behind from Reagan’s terms in office. You may have seen some version of this method before—in Kevin Rafferty and James Ridgeway’s Feed, for example, which uses raw footage from the 1992 presidential primaries to show candidates in their unguarded moments. Or you might know Andrei Ujica’s 2010 The Autobiography of Nicolae Ceausescu, an astonishing history of the Romanian dictator assembled entirely from his propaganda films. But if The Reagan Show is not unprecedented in its approach, it has the distinction of revealing a turning point in American democracy from a dual perspective: the inside point-of-view of the jocular, self-confident Reagan and his clique, and the viewpoint of the increasingly bitter journalists complaining about having been shut out. But what about today’s audience? Does The Reagan Show shut us out, too? Anyone who lived as an adult through the 1980s will recognize at once that The Reagan Show makes no attempt to provide a comprehensive history, or even a coherent one, despite its roughly chronological scheme. The film begins, for all purposes, in 1983, after much of Reagan’s agenda was in place: the tax cuts for the rich, the union busting, the race-baiting assault on social welfare programs. (Also unmentioned: the assassination attempt that made Reagan, in the public eye, both a near-martyr and an even tougher guy than before.) Reagan’s one military adventure, the 1983 invasion of Grenada, leaves no trace in The Reagan Show. The Iran/Contra scandal does take place; but it happens without meaning—no proxy war in Central America, no criminal flouting of the law, no widely televised congressional investigation—and then blows over quickly, as soon as Reagan crinkles his eyes in the Oval Office and says, Gosh, I guess I must have done something wrong. If you know what the Reagan administration was actually about—its substance, that is, rather than its sales methods—then you wind up supplying these facts and others as you watch The Reagan Show, breaking into its airtight structure from the outside. So much for the phenomenology of the media. Just as you could not have understood the goals of Reagan’s administration if you had read only its publicity handouts, The Reagan Show demonstrates (perhaps despite itself) that you can’t grasp the function of his televisual apparatus if you confine yourself to looking at it from within. But then, studying it from outside is hardly any better. As Velez and Pettengill show, Reagan and his people succeeded in getting the news media to report on White House publicity as a story in itself and then to comment on their own commentary, in a round of distraction and self-distraction that was new at the time and has since become standard practice. It hardly matters whether the principal medium is videotape or Twitter, or whether the distractor in chief developed his persona in Hollywood or (as Hoberman says of Trump) “in a far shoddier information eco-system that was already polluted with lies and where his roustabout antics were taken for truth.” The few and powerful pursue their own interests, while the rest of are encouraged to pursue clickbait. The Reagan Show seems, to me, to be both a valiant exposé of this situation and one of its victims. That’s because Velez and Pettengill, in their fascination with image-making, have chosen to follow only one substantive issue through the Reagan years: the proposal for a space-based missile shield (his Strategic Defense Initiative, better known as Star Wars) and the subsequent summit negotiations on nuclear-weapons reductions, conducted between Reagan and the Soviet Union’s new general secretary, Mikhail Gorbachev. Observers at the time reported on the meetings between the two officials as an international duel of publicity campaigns (“the ultimate PR opportunity,” as you see George F. Will explain on ABC News); and Velez and Pettengill follow their lead, creating a narrative that goes from widespread dread of imminent nuclear war in 1983 to the signing of an image-driven but immensely consequential treaty in 1988. The Reagan Show ends happily—as its star would have wanted it to.